We’d love your help. 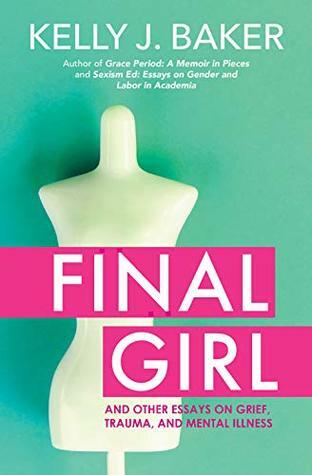 Let us know what’s wrong with this preview of Final Girl by Kelly J. Baker. This striking essay collection is not about brokenness, but rather about the slow realization of what the author survi From the author of Sexism Ed and Grace Period. This striking essay collection is not about brokenness, but rather about the slow realization of what the author survived and how she grew stronger from a place of vulnerability. Kelly J. Baker writes, "Survival was the story that I kept writing toward; it was the story that I kept trying to tell. It was the story I had to tell, often without quite noticing. It was story about abuse, brokenness, and what it might mean to mend." To ask other readers questions about Final Girl, please sign up. I have said this before (and I might be considered biased), but Kelly Baker is my idol in many ways, combining scholarly depth and emotional tension in her essays, whether they're on academia or, as in this collection, more personal issues. Final Girl manages to be personal without being a cheap expose. Some people will find that a fault, but I thought that the text does the best kind of balancing act that personal essays can do: engaging without slipping into voyeurism. I remain an ardent fan. I loved this book because for the first time in my life it validated my right to Just Walk Away! She's also the editor of Women in Higher Education, a feminist print monthly, and a freelance writer with a religious studi Kelly is the author of Gospel According to the Klan: The KKK’s Appeal to Protestant America, 1915-1930, The Zombies Are Coming! : The Realities of the Zombie Apocalypse in American Culture, Grace Period: A Memoir in Pieces, and Sexism Ed: Essays on Gender and Labor in Academia.